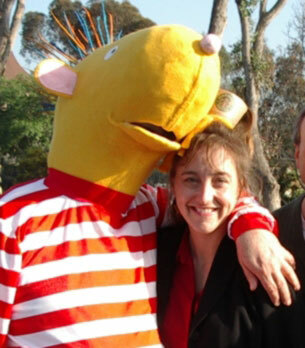 The first, official Crazy Hair Day literacy campaign event took place in San Diego, California, in the spring of 2004. After a chance meeting between Jennifer Case Nevarez and author Barney Saltzberg at the annual Society of Children's Book Writer's and Illustrators in Los Angeles, Jennifer suggested the crazy idea that they team up with the Children's Museum to launch a city-wide reading campaign in San Diego...and Barney was crazy enough to say, "Yes!" based on the book Crazy Hair Day by Barney Saltzberg. It got so crazy, even Dustin Hoffman read the book on tape, Vonda Shepard and Jackson Brown help record the official Crazy Hair Day song, and lots of famous people like Jay Leno, Fergie, and Martha Stewart even signed copies of the book to auction! in more than 120 LOCATIONS in San Diego. More than 1500 children and adults WORE CRAZY HAIR. and 4,000 POSTERS were distributed. in more than 8 CITIES throughout the US. Jennifer Case Nevarez and the character "Stanley Birdbaum" from the book Crazy Hair Day by Barney Saltzberg. Special Thanks to my crazy Dad, Larry Case, for his enthusiastic support and creative artistry in bringing this character to life! Special Thanks to Starbucks for supporting this creative literacy initiative and for helping to make it a huge success! The first annual Crazy Hair Day celebration took place in San Diego on Wednesday, March 10, 2004. Crazy Hair Day for the entire City of San Diego. Starbucks Coffee Company provided 500 free copies of the book for volunteer readers to read and leave as a permanent addition to classroom, school, and community libraries. Celebrity and volunteer readers were recruited through the Starbucks Coffee Company Make Your Mark Volunteer program. Starbucks Coffee Company provided 500 free copies of the book for volunteer readers to read and leave as a permanent addition to classroom, school, and community libraries. Celebrity and volunteer readers were recruited through the Starbucks Coffee Company Make Your Mark Volunteer program to read to children. Readings took place in English, Spanish, and American Sign Language. and deployed military volunteers also participated by reading on video. Author and illustrator Barney Saltzberg made numerous appearances for read alouds, book signings, and media interviews. The mascot Stanley Birdbaum was also created by architect Larry H. Case and appeared to entertain children and their families in numerous locations. Crazy Hair parties, art activities, and fundraising efforts were hosted in more than 120 sites throughout the city. Much thanks to the numerous businesses and community organizations that supported Crazy Hair Day 2004. Starbucks Coffee Company, Borders Bookstores, Super Cuts, Seaport Village, Upstart Crow Bookstore, North Island Federal Credit Union, Athletes for Education, Marriott Courtyard Hotel, San Diego County Office of Education, Stroller Strides. Parent Connection, Carl E. Woodward architect Larry Case, and major local media including local KUSI, NBC 7-39, ABC affiliate KGTV, CBS affiliate KFMB, COX, FOX, KPBS, KIFM radio, KYXY radio, KPRZ radio, Telemundo, Univision, the San Diego Union Tribune, Metropolitan Magazine, The Kids Directory, the Presidio Sentinel, Coastal News Group, and Publisher’s Weekly Magazine. Crazy Hair Day Month was celebrated in April 2005 when regional children’s museums came together with numerous community organizations and Starbucks Coffee Company to promote literacy and build community through the magic of reading. New Orleans, Louisiana went crazy for kids and crazy for reading in April as the entire Crescent City celebratds Crazy Hair Day! Community readings took place in schools and libraries and Starbucks Coffee Company locations throughout the city on April 15th. The Louisiana Children’s Museum hosted a fun-filled day of events at the museum on April 16th when families came by to crazy up their hair, meet author and illustrator Barney Saltzberg and numerous celebrity readers, and enjoy a wide range of creative and CRAZY activities throughout the day! The entire state of Colorado joined the Children’s Museum of Denver in celebrating Crazy Hair Day in April with readings hosted in schools and libraries throughout the city while Starbucks Coffee Company hosted reading in numerous stores and locations throughout the state. Community members were invited to participate in fun Crazy Hair Day family activities at the museum as well. Are you crazy about kids, crazy about reading, or just plain crazy? San Diego celebrated reading with the support of KidsKorps USA, Harmonium, and the San Diego Unified School District, community readings took place on behalf of the children's museum in schools, libraries, and community sites. Author Barney Saltzberg appeared also at Yellowbook Road in La Mesa on April 12th after the opening kick-off ceremony at 8am at nationally-recognized Central Elementary School. We celebrated Crazy Hair Day month nationally in April 2006!